I really just have one question. WHY? Why the hell is it so hot here? I feel like I complain about the heat on all too regular a basis. But really now. It was 113 here with the heat index the other day. That's just not ok. Despite the sweltering temperatures, I've picked up a new habit. Nearly every day, I head over the bridge to get a honey latte from Metto. My friend Adair introduced me to them a year or so ago, and they've been a regular indulgence ever since. Mostly, I like my coffee plain and simple. No milk, no cream, no sugar. I really like to taste the coffee. The only real exceptions to my black coffee rule are very dry cappuccinos Vietnamese coffee. I first had Vietnamese coffee at one of my favorite restaurants in Chicago, Le Colonial. Though there are locations in New York and San Francisco, I tend to think of Le Colonial as a distinctly Chicago institution. While I'm usually pretty adventurous at restaurants and generally taste a new dish every time I go to Le Colonial, my appetizer and my dessert never change. I always go for the sugar-cane shrimp to start my meal, and I never end a meal there without the Vietnamese coffee. In all honesty, Vietnamese coffee really kind of breaks all of the rules. It is basically super-strong, chicory-flavored coffee mixed with sweetened condensed milk. You can't get much sweeter or much milkier than that. Since I can't get my Vietnamese coffee fix here, I have to make one at home if the craving becomes overwhelming. 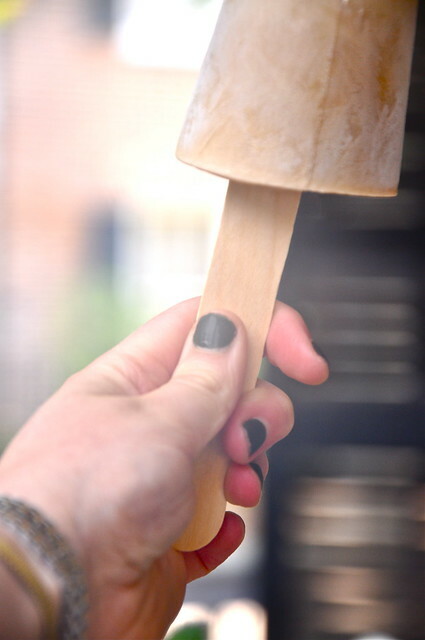 I decided to make one of my favorite treats all the more crave-able by turning them into popsicles- the perfect way to cool down this summer. Empty sweetened condensed milk into a medium-sized bowl. 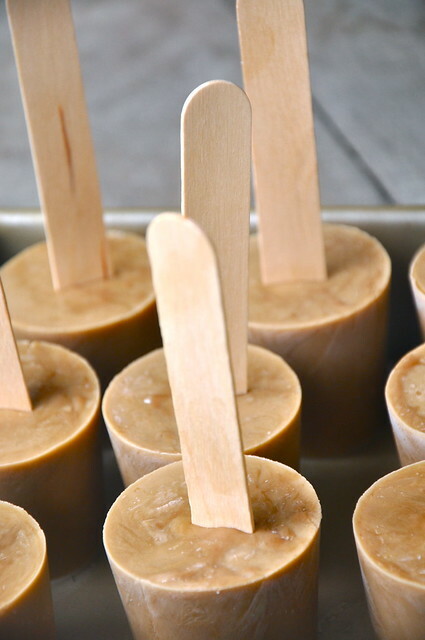 Slowly whisk coffee into sweetened condensed milk until smooth and no lumps remain. Whisk in heavy cream. 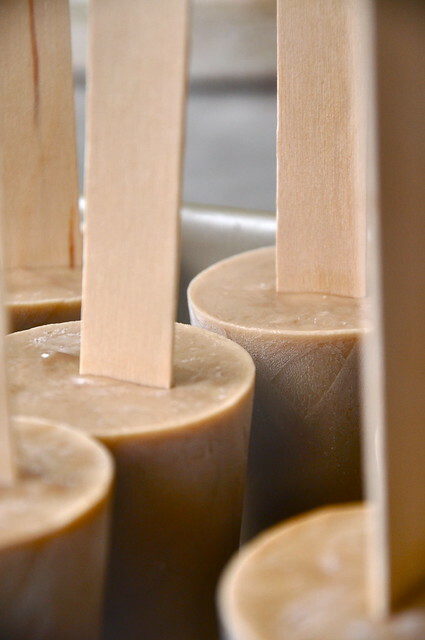 Divide between 9 Dixie cups or pour into popsicle molds. Freeze for 3 hours, until starting to firm up. 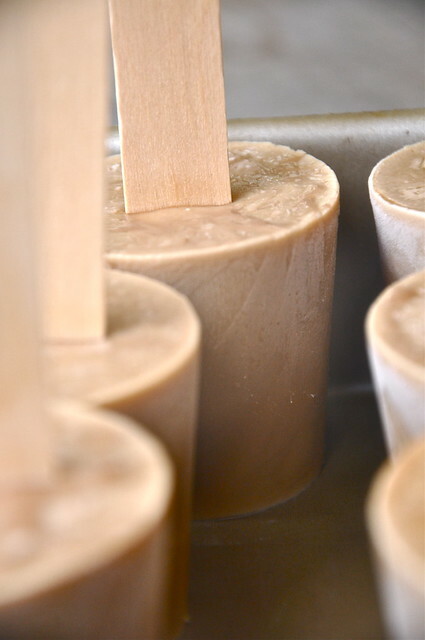 Insert popsicle sticks into popsicles. Freeze for another 3 hours to harden completely. Cut off Dixie cups before serving.